Your Squirrel is always on the go and could care less about slowing down to use the potty! The key to potty training your Squirrel is keeping them engaged. Your Squirrel does well with extra incentives, including praise and games. Learn how to keep your Squirrel engaged with potty scripts tailored specifically to your little one's personality. I’ll race ya into the bathroom! Potty time! Your poops need to come out so you can be healthy. 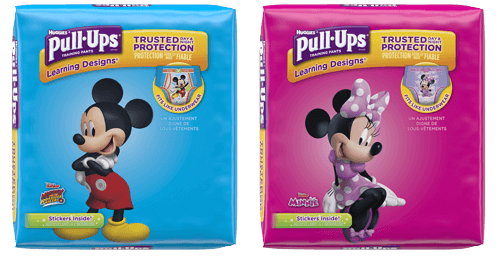 It’s your choice whether you put them in the potty or in your Pull-Ups®, but they need to come out so you won’t get sick. Do you pick Pull-Ups or the potty today? Look, the Big Kids are going for a potty break. Let’s follow them, so you can try too! Let’s look in every single open stall in the mall’s bathroom. You pick the one you want to use. You have a lot of energy today! I want you to race back and forth in the hallway 17 times, and then we try the potty. Ready, set, go! Let’s sing a silly song about potties while you wait for the poop to come out. Okay, you’ve been playing about 20 minutes. I’m going to set this timer for two more minutes, and then it’s time to try the potty. Wow, this new potty I got for you sings when you put pee pee or poop into it. Let’s give it a go and see if you can make some music! Hmm, it’s that time of day when you often make some poop. Let’s head to the bathroom with those dinosaurs so we can be ready when the poop comes.